EAST HARLEM — Preliminary tests support the theory that a natural gas leak caused the explosion that demolished two buildings and killed eight people, federal investigators said Friday. Soil in the surrounding area had a natural gas concentration of between five to 20 percent a few hours after the blast, National Transportation Safety Board representative Robert Sumwalt said. "Normally the soil in New York City 18 to 24 inches into the ground would have zero percent concentration," Sumwalt said during a Friday afternoon briefing. "That further leads to our hypothesis that this was a natural gas leak." 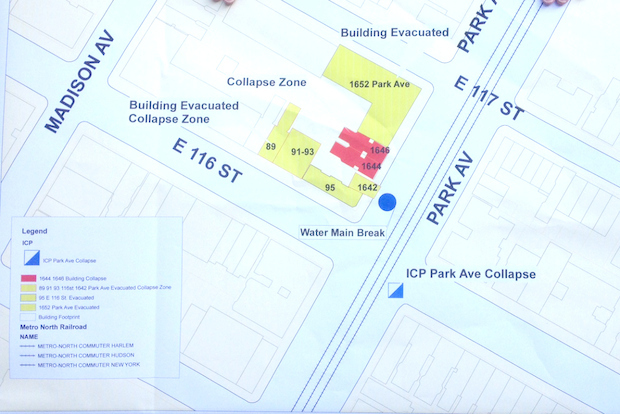 NTSB investigators have also begun to develop a timeline of the events that lead to the fatal explosion of 1644 and 1646 Park Ave. on Wednesday. According to reports from Con Ed's dispatch center, a call reporting the gassy odor came in at 9:13 a.m. An emergency crew was dispatched two minutes later and a crew arrived at 9:40 a.m., after the fatal explosion, Sumwalt said. Fire Department Commissioner Salvator Cassano said that about 60 percent of the site had been cleared of debris, meaning investigators will soon have access to inspect the site. Investigators said they will a conduct pressure test on the main line - an eight-inch cast iron pipe installed in 1887 - and the feeder pipes to try to determine where the leak happened. The age of the pipe may not necessarily be connected to the explosion. "Pipeline operators are required by federal law to have an integrity management system to be able to manage their risk," Sumwalt said. "So if a pipe is properly managed and the risk assessment is properly done, the age should not be a factor." NTSB investigators will also look into whether or not the gas had a strong odor in order to figure out when the leak began. Gas companies add odor to natural gas, which has none, in order to help people detect leaks. "There was no smell of gas in the church," Spanish Christian Church Pastor Thomas Perez said Friday. The church, which has a kitchen in the basement, had a 10 p.m. service the night before the explosion, the pastor added. Investigators are reaching out to anyone who saw the explosion or smelled gas in the days before the blast. Any people with information should contact the NTSB through the email address witness@NTSB.gov. It was still unclear when those evacuated after the explosion will be able to return to their homes. The NTSB is "24 to 24 hours" away from being allowed to conduct pressure tests to determine the location o the leak, Sumwalt said.